The Isle of Wight is an island off the coast of southern England accessed by a short ferry trip from the mainland across the Solent. Heavily geared towards tourism, the Isle of Wight has a wildlife rich interior surrounded by a coastline with good beaches and cliffs - a summer playground for holidaymakers. Because it is gently hilly with little traffic and roads that tend to go around the hills, it is an excellent location for a cycling holiday. As a small island surrounded by sea there is plenty of sailing and an annual regatta at Cowes. Ryde - has 6 km of beaches and attracts large numbers of tourists. It is an all weather resort. If it rains holidaymakers can go bowling, ice skating or visit one of the museums. Ventnor - beach set in a sheltered bay and a small harbour. There is an outdoor paddling pool for toddlers and a fresh fish shop to purchase some of the daily catch to cook at home. Cowes - where the annual regatta or Cowes week is held. Shanklin - good beaches and Shanklin Chine which is a wooded gorge with sub-tropical vegetation and walkways for visitors. There is a charge for entry. There is a lot more information about holidays on the Isle of Wight available on the web. 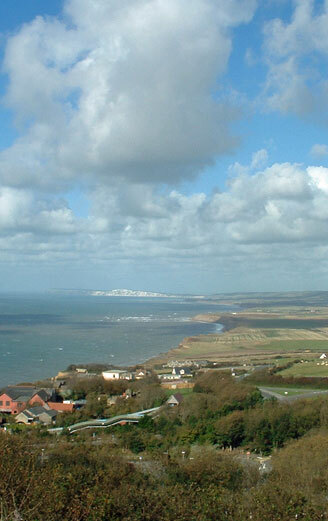 As an island, the Isle of Wight experiences slightly different weather from the mainland. Surrounded by water, sea mists may creep in during the autumn and a cooling breeze makes for a comfortable summer. Wind and gentle breezes help small yachts plough through the seas and contributes to this being a superb region for sailing.